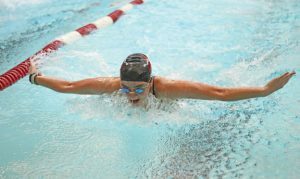 NAUGATUCK — The Naugatuck girls swim team lacked the depth needed to stay competitive with the top teams in the NVL over the past few seasons. An influx of young talent might be exactly what the Greyhounds need to close the gap. That talent was on display in the season-opener against Torrington on Sept. 14, as the Greyhounds won seven of the first nine events before finishing with a 93-77 victory. Sophomore Katelyn Fortney won the 50 free in 26.85 and took second in the 100 fly in 1:07.27. Freshman Jacqueline Uva made a good first impression by winning the 200 free in 2:13.85 and swimming to a third in the 100 fly. Naugy has its share of upperclassmen to lead the way. Junior Meghan Korowotny raced to a pair of second-place finishes in the 50 free (29.58) and the 100 free (1:07.40). Senior Abrianna Hasipi took second in the 200 free in 2:25.85 and third in the 500. Naugatuck got out to big lead to start the meet with the foursome of junior Molly Kennelly, senior Maria Guimaraes, Fortney and Korowotny winning the 200 medley relay in 2:04.85. The Greyhounds did it again with the team of Guimaraes, sophomore Abby Shugdinis, senior Francesca Spino and Uva swimming to victory in the 200 freestyle relay in 1:58.13. The squad of freshmen Emily Meyer and Kanny Salike and seniors Faith Rawding and Taylor Siefer took third, as Naugy completed its second one-three finish in the relays. The Greyhounds showed off one of their strengths this year when seniors Katie Brown and Brin Battisti took first and second in diving, respectively. The solid contributions from the freshmen stood out throughout the meet. Kelly Brodeur put on a valiant effort at the end of the 500 freestyle to out-touch her opponent at the wall and finish first by 0.28 seconds in 6:33.80. Haley Deller made a successful debut, taking second in the 200 IM in 2:36.85. Freshman Alena Rotatori was part of the 200 medley relay foursome that took third place and gave Naugy another threat in the 500 freestyle by finishing fourth. “I thought Uva put up a real competitive time in the 200 and Deller did very well in her first IM,” McKee said. 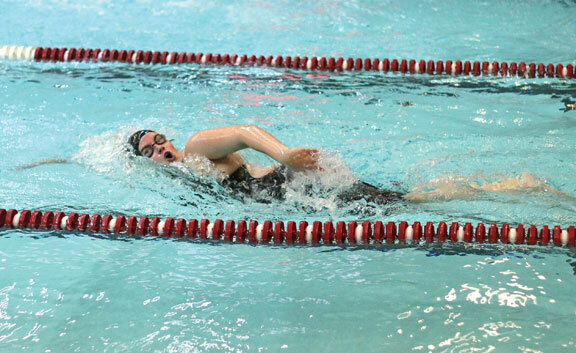 “Brodeur really put on a surge at the end of the IM and the 500 to overtake the Torrington girl, and that was good to see. The Greyhounds improved to 2-0 on the season with a 93.5-84.5 over Sacred Heart on Sept. 18. Naugatuck was scheduled to face Oxford last Friday. Results from the meet weren’t reported as of this post. The Greyhounds will host Woodland on Tuesday and St. Paul on Friday.